Found on Singleton Avenue, Taquero has already earned a place in the Dallas famous Mexican restaurants next to Trompo and Tacos Mariachi. You’ll have to sit outside, which can be blazing hot in the Texas summer, and even outside there’s not much room. Try the affordable Olmeca ($ 5), a huge, meaty combo in a striking blue corn tortilla. The seafood Tacos with grilled shrimp are certainly worth at try. ceviche feature with generous sliced avocado. Ceviche is actually raw fish, but it’s been “cooked” in an acid like lemon or lime; if you’ve never tried it, this is your chance. I’m not sure I’d call it a “hole in the wall”, but there are only 10 chairs; so be prepared for a wait, hopefully in your air-conditioned car. 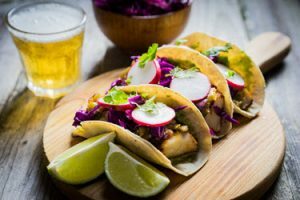 Do you like a little Bangkok style in your Tacos? Such as frog leggs and Thai curry sauce? Or cabrito (young goat). The homemade corn tortillas are cooked to perfection, and great for sopping up all those juices that ooze out. We mentioned deviche above; and here you can get quite a selection. There is a special “back room” for reservations only, including an eight-five dollar seven-course meal which might include lobster tacos, seared duck breast, and of course, Mexico’s famous mole rojo, with the famous tres leches (3 milks) for desert. Generally, a mole sauce contains a fruit, chili pepper, nut and spices like black pepper, cinnamon and cumin, but they can vary quite a bit, depending on the recipe and cook. Maskaras is the Spanish slang word for “masks”, and if you ever saw “Nacho Libre” – you know about the luchadores (wrestlers) of Mexico that wear such masks. You can see posters, and figurines of famous ones like El Santo, Blue Demon, and Rey Mysterio and the kids can even try on some masks. Oh yea, back to the food. The carne asada they use on the tacos is delicious, and the pico de gallo is to worth fighting for. Beef and lime squirts – what could be better? Black beans, queso and of course avocado. Not fancy, simple but great tasting menu that’s worth trying at least once a month! Family owned and operated. In Dallas, you actually get tortillas at many Mexican grocery stores. Or you can go to a full-fledged tortilla factory that also provides limited food service,such as an old tradition: La Nueva Fresh & Hot slings classic guisados (a wide-ranging collection of slow-cooked stews cooked throughout the morning). Tacos like the rajas con queso (roasted poblano strips with melted cheese), the signature guisado verde of pork wrapped in tongue-charring green chile sauce and the lamb barbacoa in doubled-up their home-made tortillas make the trip over to that part of town worth the extra drive.